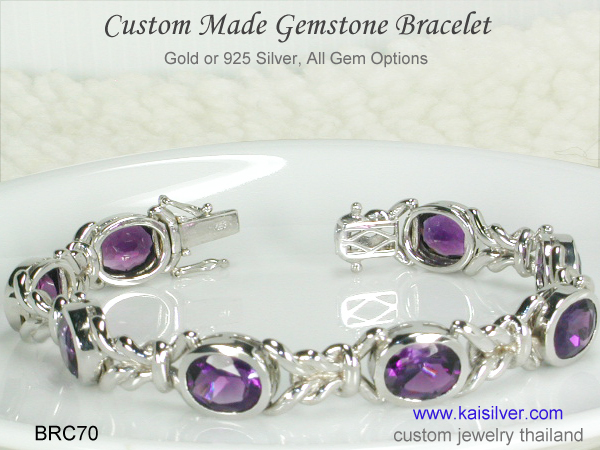 Kaisilver bracelets are fully custom made which means that, you choose the design, dimensions and gemstones for your bracelet. The designs on our website are merely meant to inspire your own imagination, you could pick one of them and ask for modifications or, send us your own design concepts to be custom made. 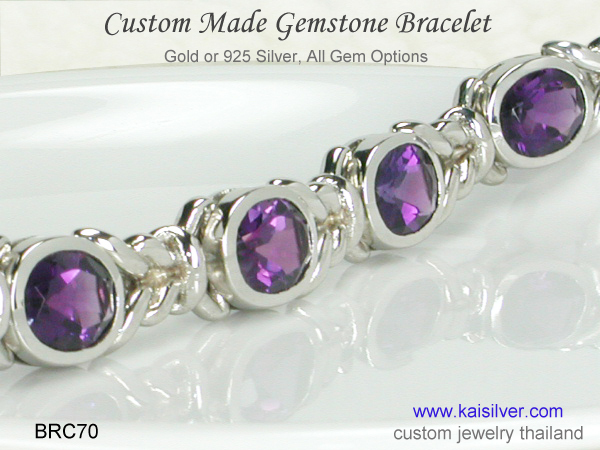 The BRC70 is an amethyst bracelet, the jewel is built to dazzle and keep looking good for a very long time. Style conscious women love to wear bracelets that can be felt on the wrist, significant investment in precious metals is required to get this feel. Amethyst is a gemstone that has been known for many centuries, it has been bestowed with some tremendous traditions and customs. You could find a whole lot of amethyst bracelets that are cheaper than the BRC70 but, if you wish to wear a bracelet that fuses beauty, durability and significant gemstone value - few can compete with this amethyst gemstone bracelet. There was a time when very limited quantities were mined, prices were high and the gemstone went beyond the reach of many. A more logical pricing structure developed when, mining operations began in Brazil and parts of Africa. Kaisilver procures huge amethyst geodes from leading miners, each geode is split open and the best amethyst gems cut and polished. It might be easier to pick ready stones from the market but, that really does not allow us to handpick true value for our clients. Custom made in 14k / 18k gold 3 gold colors and sterling silver. The design including gem shapes and sizes, can be customized. Each bracelet is fully custom made, you can specify the required length. We can also custom make a gemstone bracelet with your design. The bracelet has a gold weight of 40 grams / silver weight of 30 grams. The gemstones are 10x8mm or 9x7mm ovals, refer to the price table. There is no limitation on the gemstones that can be selected. Gems can be mixed in the same bracelet, price quotes will be provided. 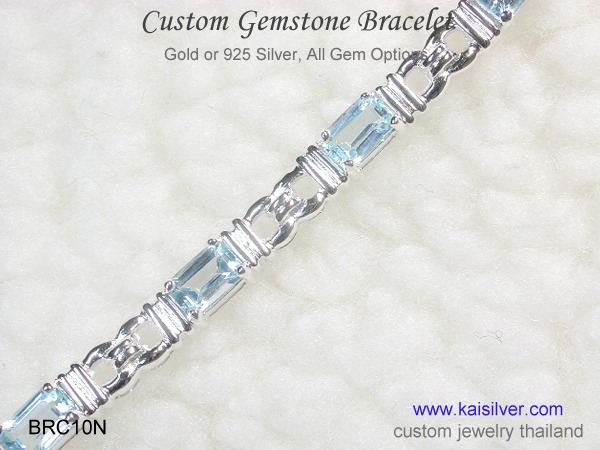 The design of this piece is suited for a family birthstone bracelet. While most of you would be aware that amethyst is a purple colored gem, here is an extra note on the issue of amethyst color. The color range of this gem ranges from a very pale (lavender) color, moves into a medium purple shade and finally to a deep purple color. A pale colored amethyst generally draws little attention, the gem is more suited for gem carving applications. The dark purple color is a bit too saturated, light that enters the stone is largely absorbed and has little chance of reflecting back from the cuts and facets. The gems that we select and recommend for this amethyst bracelet, are the medium color range. These gems sparkle and cast a spell on the viewer, the color is there for its beauty. Light that strikes these gems, playfully reflects on the inner facets and is splashed back right out of the gem. 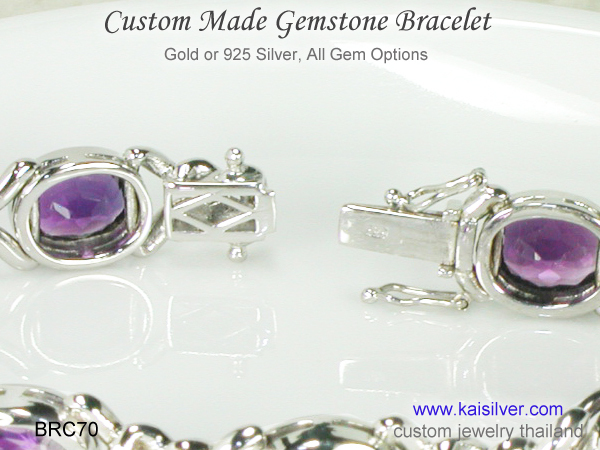 You can specify the color shade of the gemstones for your amethyst gemstone bracelet at the time of ordering. 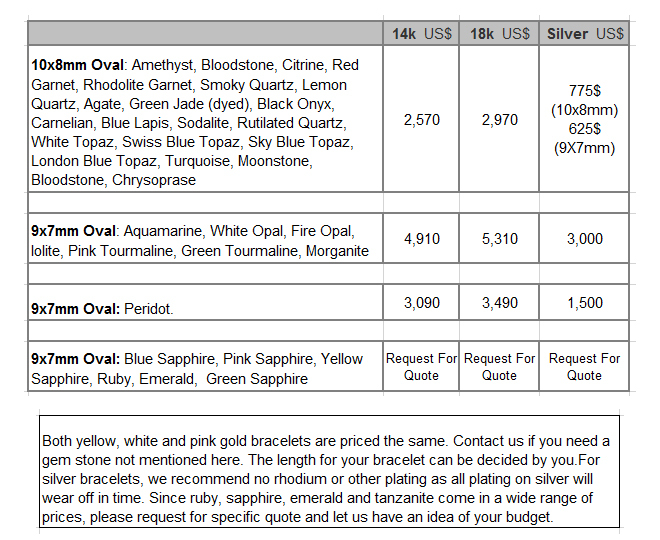 A short note on the choice of metal for the BRC70 custom made bracelet. As mentioned above, you can order a gold or 925 silver bracelet, both metal options get the same quality of workmanship and gemstones. The amethyst gold bracelet can be ordered in 14k or 18k gold, you have yellow, white or pink gold options to choose from. When talking about a custom made silver bracelet, you need to understand the effects of plating on the metal. 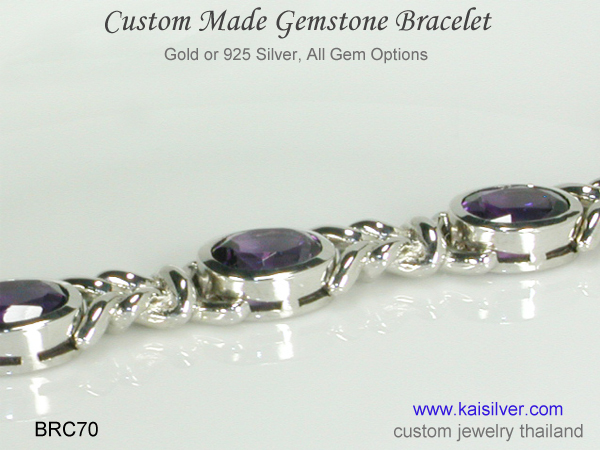 Choosing a rhodium or gold plating for a silver gemstone bracelet, will instantly give the piece a more valuable look. However the truth is that the plating will not be permanent and will come off after a while. We would therefore recommend that the silver amethyst bracelet be left without any plating, we leave the final decision to you. Customization Ideas: Since this is a custom bracelet, it is a great idea to discuss a few customization options here. Remember that all the features of your bracelet can be decided by you, we could even change the entire design to suit your preferences. We would be equally comfortable making your bracelet with a a design provided by you. The shape and size of the gemstones can be chosen by you. The bracelet is shown here with amethyst gem, you could choose the gemstone of your choice and even, combine different gems in a single bracelet. Gems can be selected based on color, you could also pick gemstones based on traditions and customs. The practice of wearing birthstones has existed for many centuries, it is popular even today. It is possible to repeat your birthstone all through the bracelet, you could even consider combining all family birthstones and make a gorgeous family birthstone bracelet. If you happen to be going for the gold bracelet, consider the gold color based on the gemstone colors set in the piece. 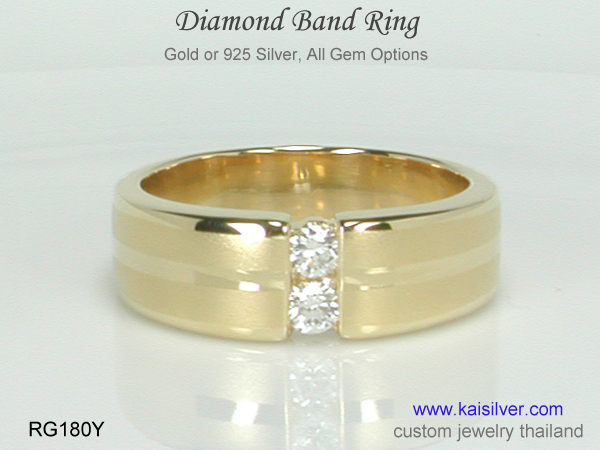 Kaisilver: Widely accepted as the world's leading online custom made jewelry provider, we craft all types of jewelry in gold and 925 silver. The same stringent quality standards are maintained for gold and 925 silver jewelry. You can choose a design from our websites or send us sketches of your own design concept. With gem procurement expertise extending to every gem and every gemstone mining location in the world, we place no restrictions on your choice for gemstones. You can contact our experts at sales@kaisilver.com to discuss any issue related to gems and jewelry, it does not matter if you intend to make no purchase from us.